Tironui. Stunning ocean, harbour and island views. Completed in 2012, this elevated modern holiday home offers relaxed, luxurious holiday accommodation for up to 10. Tironui features amazing sea views and has everything you would expect in a modern new home, including: excellent WiFi internet access, gas fire, heat pump, tinted double glazing, water filter and a large 300 lt dual element hot water cylinder for endless hot water. The house is tastefully decorated, including many pieces of original artwork by local artists. The kitchen is fully equipped and includes: a double dish-drawer dishwasher, ceramic cooktop, under bench oven, microwave, waste disposal and a Nespresso coffee machine. Water is treated town supply. Enjoy indoor/outdoor flow to the large north facing deck which features outdoor dining and gas BBQ. The house gets all-day sun and is warm, dry and sunny. The Master Bed room features floor length glass with expansive views from the queen bed across Tairua Township, Tairua Harbour, Mt Paku and beyond to the Alderman Islands. The en-suite features a "loo and a bath with a view" as well as the usual shower and vanity. Lie in bed, watch the sun rise and enjoy direct access to deck. The large, carpeted downstairs rumpus room, with a 2nd TV and fridge, provides an ideal area for older children and also acts as a 4th bedroom, sleeping up to 4. The Queen size bed enjoys the same stunning views as the upstairs master bedroom. Excellent off-street parking is available for up to 4 cars, or 3 and a boat trailer. 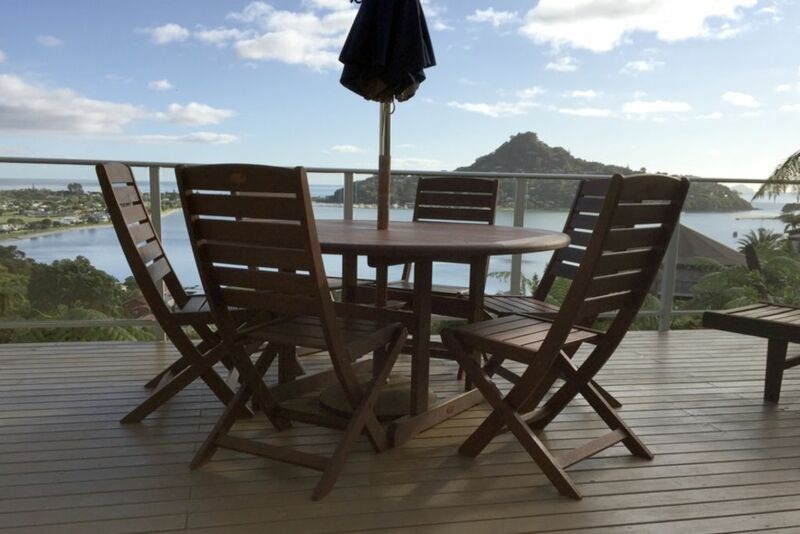 Tairua is the ideal base for your Coromandel holiday. The harbour provides safe swimming for younger children, while the surf beach provides something more challenging for the more adventurous swimmer or surfer. Cathederal Cove, Hahei, Hot Water Beach and Whitianga are all an easy drive away. Catch the ferry to Pauanui or enjoy some of the many bush walks or historic sites in the area. Extensive tourist information is available for guests in house or visit the i-site in town. Mature adults and families preferred. No smoking inside. No parties or activities likely to cause offense or annoyance to our neighbours. Maximum four vehicles, including trailers, on site and must not block our neighbours access to their homes. No casual or extra guests without prior permission. All children (under the age of 18) must be under the supervision of a responsible adult at all times. No pets. Having a great holiday - compulsory!! Owners, David and Anne have owned their own business in Cambridge for over 24 years. Before that they were both teachers. Their business Lilies by Blewden is New Zealand's premier producer of cut-flower lilies for export and use by the top-florists throughout New Zealand. Growing up David's family enjoyed their summer holidays at Hahei, where the days were spent fishing, diving and exploring. A life long love for the area developed and the Tairua home allows their family to enjoy the same summer holidays adventures that David enjoyed growing up. Tairua is easily accesible from Auckland and Waikato in under 2 hours. It provides a great base from which to explore the rest of the Coromandel Peninsular. Tairua has excellent surf and harbour beaches as well as an excellent selection of cafes, resturants and bars. We cherish the beauty and heritage of the Coromandel and our Tairua home provides a base to create life-long memories with our own children, relations and friends. We designed and built this home in 2012 to take advantage of the location and outstanding views. The key features we wanted to incorporate included: The ability to lie in bed and admire the fantastic view, easy ground level entry, plenty of off-street parking for vehicles and boats. Its an easy walk to town, cafes, resturants and the harbour. Only short drive to Cathedral Cove and Hot Water Beach and 40 mins to Whitianga or Thames. toilet, tub, shower, Lie in the bath and admire the view! At additional fee or bring your own. Room for up to 4 vehicles. Included with linen or bring your own. Tea, coffee, sugar supplied. Guests are requested to replace any other items used. Freeview. Or bring your own sky decoder and plug in. Great location with outstanding views. Walking distance to town. Nicely appointed house with everything one needs. Great deck to enjoy coffee in the morning and wine in the evening. This property was very clean and user friendly. We stayed there with our family and found it very comfortable. The views are amazing and we were lucky to be there New Years Eve and watch the fireworks display. Would recommend this property and stay there again. We really enjoyed our stay and thank the owners for making it so comfortable. We had a lovely holiday. Brilliant location and great views. Brilliant location and great views. Nice new property, well designed.